All-American adventures with the keen-eyed duo who haggle for items with collectible value. The crew discover a jukebox in an old general store. 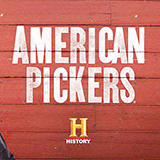 American Pickers was broadcast on Dave at Sunday 14 April 2019, 12:00.